Complete care from Microsoft; who would have guessed? OneCare is in many senses an admission of guilt. It's the embodiment of Microsoft pulling its head out of the sand, noticing that there's something fundamentally wrong with its flagship OS, and finally doing something about it. It's also a true cynic's playground. Microsoft charging a subscription fee - albeit a rather small one - to keep an eye on the holes that it left in Windows XP seems a bit rich, especially considering the price of XP in the first place. Cosa Nostra fans might deem this a protection racket, and it's one that is likely to leave anti-virus pioneers fuming. Symantec has already thrown its tattered hat into the ring by taking Microsoft to court, claiming misappropriation of intellectual property. The fact that you have to pay may have something to do with Microsoft not being able to cram adverts into OneCare's never-ending barrage of warning balloons. To its credit, OneCare does keep itself up to date without the need for any interaction: a positive in the company of more nag-happy competitors. That said, the initial install is a bit of a hassle; you'll need to be WGA authenticated, run a separate system check application, and then install the application via an ActiveX control on the web. This seems counter-productive, since your target PC has to be connected to the web before it can protect itself from web-borne attacks. While it's a little clumsy in its execution, the interface is well suited to OneCare's target audience. It's simple, and it tells you everything you need to know in plain language. If you're used to manually configuring your firewall or, well, having any hands-on input into anything, you're out of luck. The closest you'll come is setting the folders that the integral Anti-virus component searches. 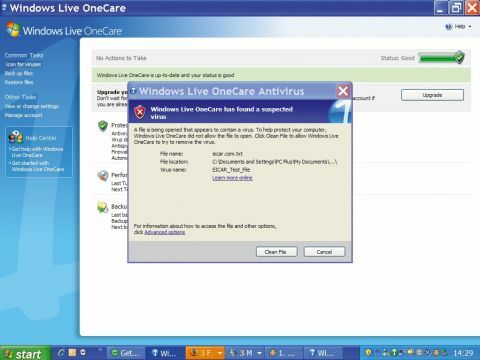 OneCare gets one up on its rivals by covering a few more bases: there's the antivirus, Microsoft's own; antispyware in the form of Windows Defender, a heavily retooled version of the excellent Giant Antispyware; Windows Firewall, basically unchanged but in a sensible place at last; Backup and Restore features, sorely lacking from XP previously; and encapsulated management of everything update-related. Each component - pared down in customary new-Microsoft style - does its job with aplomb. Far from the cumbersome, unfriendly frontends presented by certain antivirus packages, Microsoft's effort is a click-and- go beauty. Even though the speed of scanning is relatively quick, it does run into some trouble when exploring archives. One of the zip files on our test machine - that happened to hold an ISO image containing CAB files - brought it to its knees for a good half an hour. It's the price you pay for being so thorough. The speed shouldn't worry you though, as you probably won't want to turn to OneCare more than once a week or so. The all-in-one tune-up function periodically runs a selection of set tasks, ensuring that everything gets done. It misses the anti-spyware scan - presumably because Windows Defender already has its eye on everything - but includes disk defragmentation (an oft-forgotten chore), and does its utmost to keep your machine running smoothly. Tuneup also performs automated back ups of crucial files, should you be properly tooled up with an external hard drive. We didn't have any luck convincing it to recognise any of our USB keys, so hard drives are your only choice unless you plump to manually back up to CD. With the addition of so many friendly features, you'd think that OneCare would have the market sewn up. But it doesn't quite, because of one glaring omission: anti-spam. Microsoft's assumption that most people already get anti-spam protection from their ISP could prove costly in light of future projects from the likes of Symantec and Sophos, especially if its competitors can move to a more competitive price point. We suspect OneCare isn't designed to last for long; it's XPcentric, so there will be no need for it in Vista. Windows Defender has already been confirmed as part of the next OS, as have the back up and restore functions, all laid out in the same neat fashion.